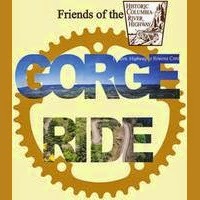 Help the Friends of the Columbia River Gorge Historic Highway with their 9th annual Gorge Ride. The Gorge Ride is the biggest fund raising event of the year for the Restore & Reconnect project of the Historic Columbia River Highway and State Trail. The Friends of the Columbia River Gorge are working on this project to create America's Best Scenic Bikeway, and you can be a part of it just by registering to ride. Read about this amazing bike riding event in the Gorge below. The ninth annual Gorge Ride sponsored by the Friends of the Historic Columbia River Highway (FHCRH) will be held Saturday, June 20, 2015, beginning at the Gorge Discovery Center. The ride extends 19.25 miles along the historic highway and state trail west to the Senator Mark O. Hatfield West Trailhead, just east of Hood River, and then returns. The course opens at 7am, and closes at 4pm.